Gift of Laura Christianson (UND, class of 1932). Born in Antwerp and initially trained in painting by his father, Nollekens was subsequently influenced by the French Rococo style of Jean-Antoine Watteau (1634-1721). 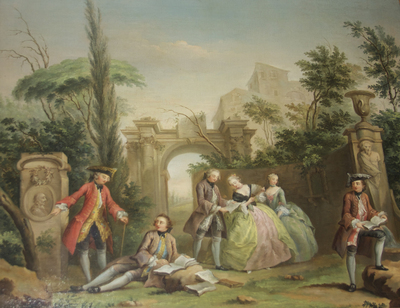 The inclusion of classical ruins in Nollekens' painting was inspired by the late classical Baroque art of Italian painter Giovanni Paolo Panini (1691-1765). Nollekens went to England in 1733, settling in London and earning his livelihood as a painter and picture restorer. The painter is sometimes referred to as "Old Nollekens" to distinguish him from his son, British-born sculptor Joseph Nollekens.